The genus Papilio features a number of large and showy swallowtail butterflies. Some are tailless (despite being referred to as swallowtails), whilst many of them have spatulate tails at vein 4 of the hindwing. Amongst the Papilio species, are the "Helens" - large black and white butterflies whose wingspan measurements range from 120mm to 150mm. 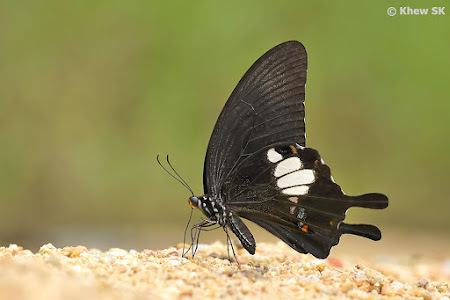 These Helens are attractive and eye-catching butterflies that prefer to stay in the sanctuary of the forested nature reserves and are hence forest-dependent species. In Singapore, only one of the Helen butterflies was listed on the early authors' checklists - the Great Helen (Papilio iswara iswara). 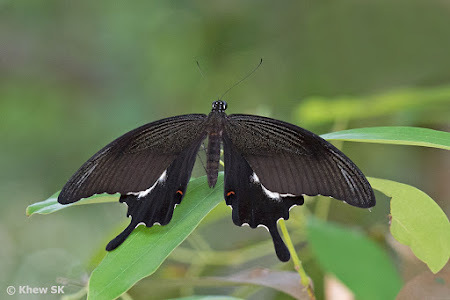 However, over the years, two more species joined the Great Helen, and on record, we now have the Blue Helen (Papilio prexaspes prexaspes) and the Red Helen (Papilio helenus helenus) in Singapore. The Blue Helen is rare, but regularly seen, suggesting that it is now 'naturalised' and a sustainable colony has established in Singapore. The Red Helen, however, is recorded from only a single individual spotted in 2014, and its status is considered a vagrant or seasonal migrant, despite being very common in Malaysia, compared to the Blue and Great Helens. 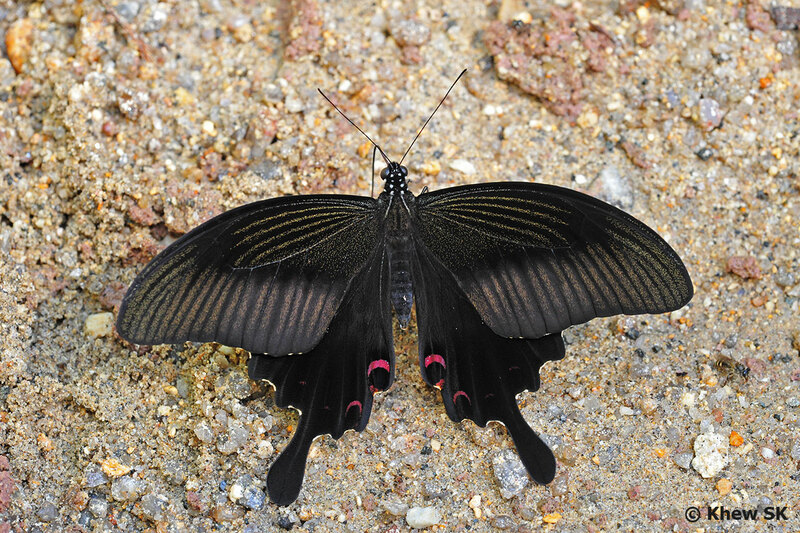 The Great Helen is the largest species of the three Helens found in Singapore, and often spotted flying at treetop level in the forested nature reserves. When the Yellow Saraca (Saraca thaipingensis) is in bloom, one can sometimes observe the Great Helen feeding greedily at the yellow flowers of this tall forest tree. This species is also often seen feeding at the flowers of the red and yellow cultivars of the Javanese Ixora (Ixora javanica) along the fringes of the nature reserves where these shrubs are cultivated. The Great Helen is also attracted to flowering Spicate Eugenia (Syzygium zeylanicum) shrubs. 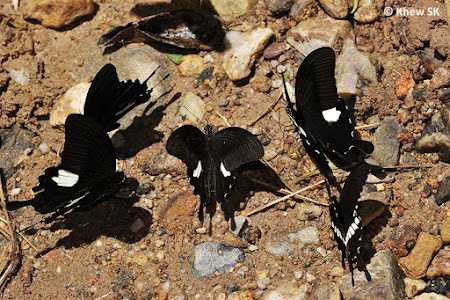 Although the butterfly has been seen puddling in Malaysia, it is rarely observed to engage in puddling activity in Singapore. 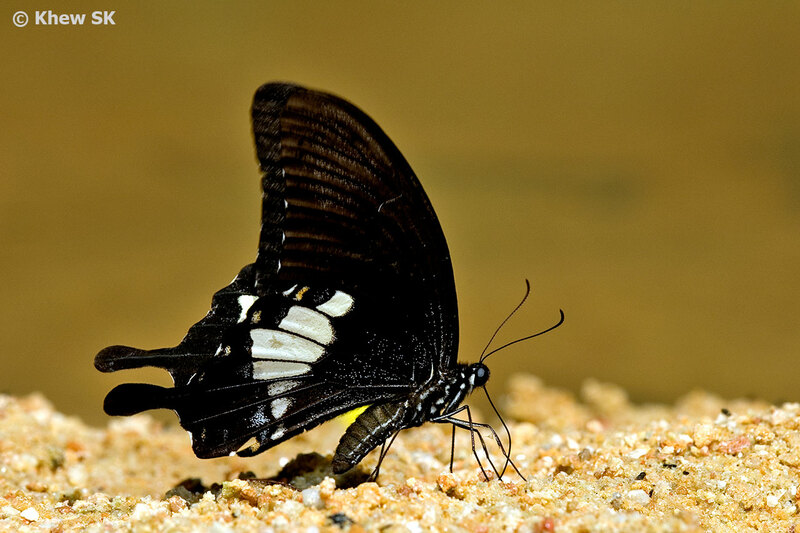 The Great Helen has a wingspan of about 130 - 150mm and the female is usually larger of the two sexes. 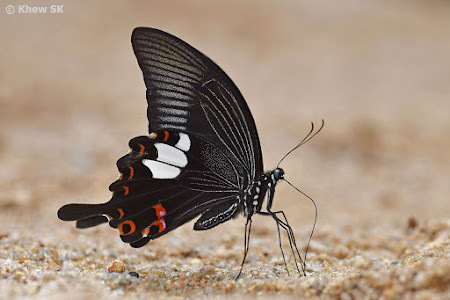 The wings are predominantly black and the forewing of the female features white post-discal streaks, reaching the termen. Both sexes feature a large white patch on the hindwing which starts from vein 4 all the way to the apex. 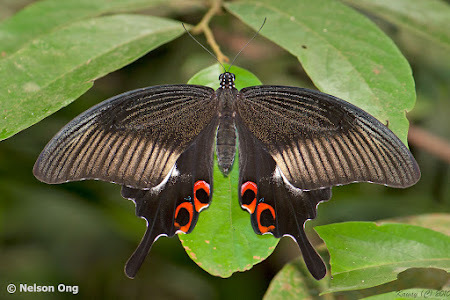 The female has large black ocellus ringed with red in spaces 1a and 2 on the upperside of the hindwing. On the underside, there are blue lunules in spaces 2,3 and 4. Another black and white species, the Blue Helen was considered a new discovery when it was spotted in the 1990's. It was absent from the checklists of the early authors and collectors and was documented as a new record for Singapore. 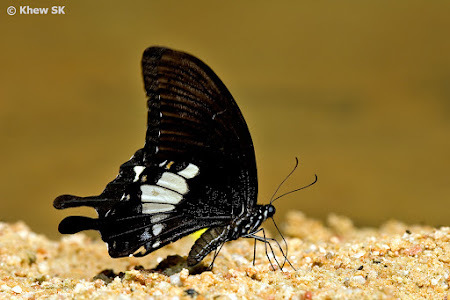 It is likely that the species migrated from Malaysia, and has since colonised areas within the nature reserves. 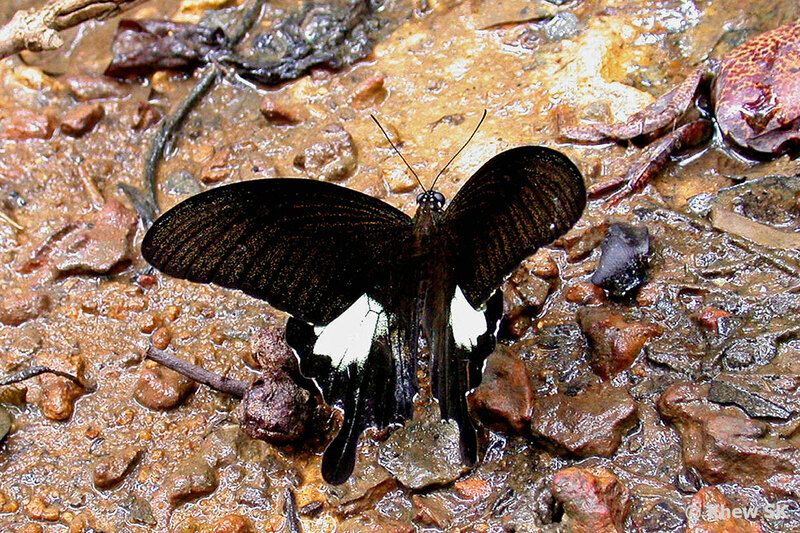 Males of the Blue Helen are observed puddling at damp sandbanks and forest trails. 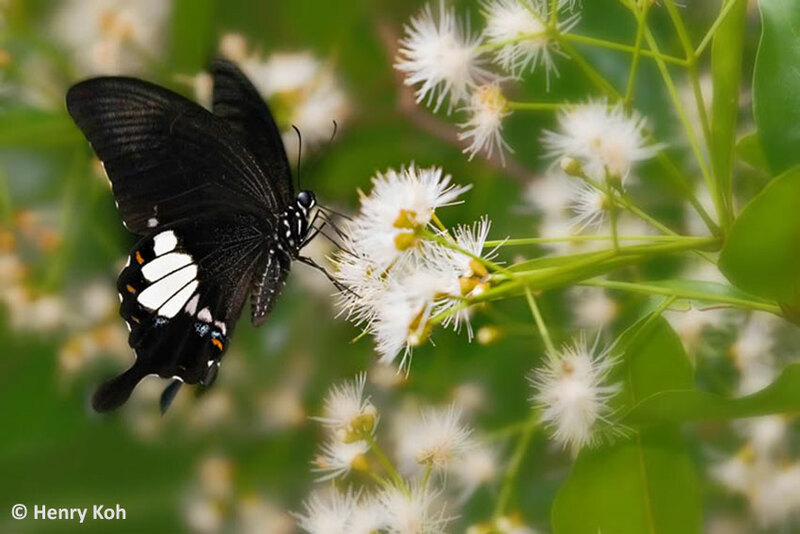 At other times, they can be seen feeding at the flowers of the Chinese Violet (Asystasia gangetica) and at Lantana and Ixora bushes. 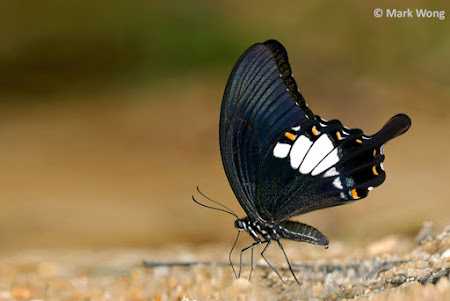 The Blue Helen is considered rare and usually individuals are sighted in the forested nature reserves. 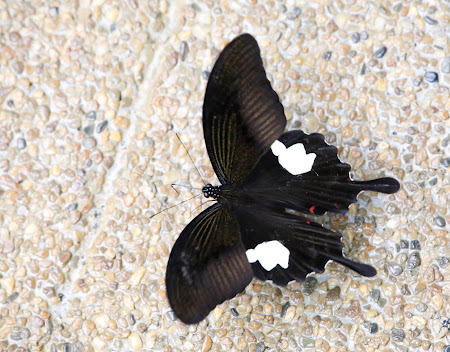 The wings are black with a white discal patch that extends into space 4. 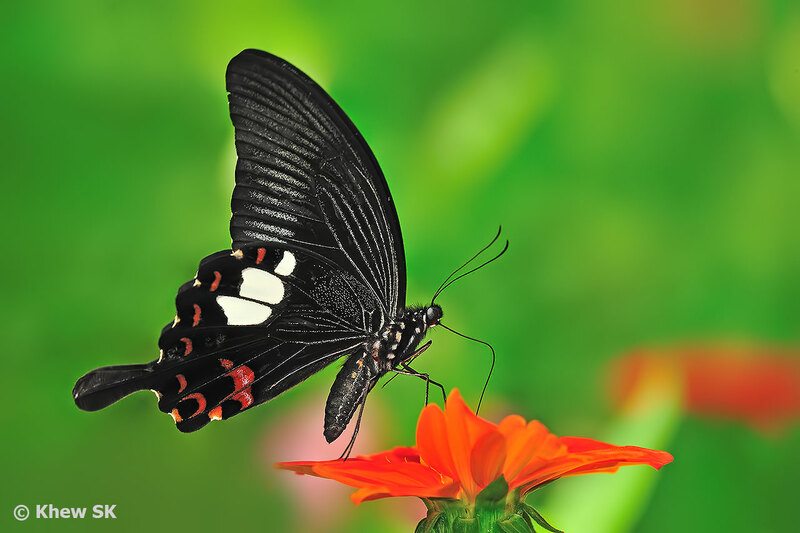 There are no red ocelli on upperside of the hindwing. On the underside of the hindwing, there are narrow yellow and blue submarginal lunules, but in some individuals some of these lunules are obscure or obsolete. 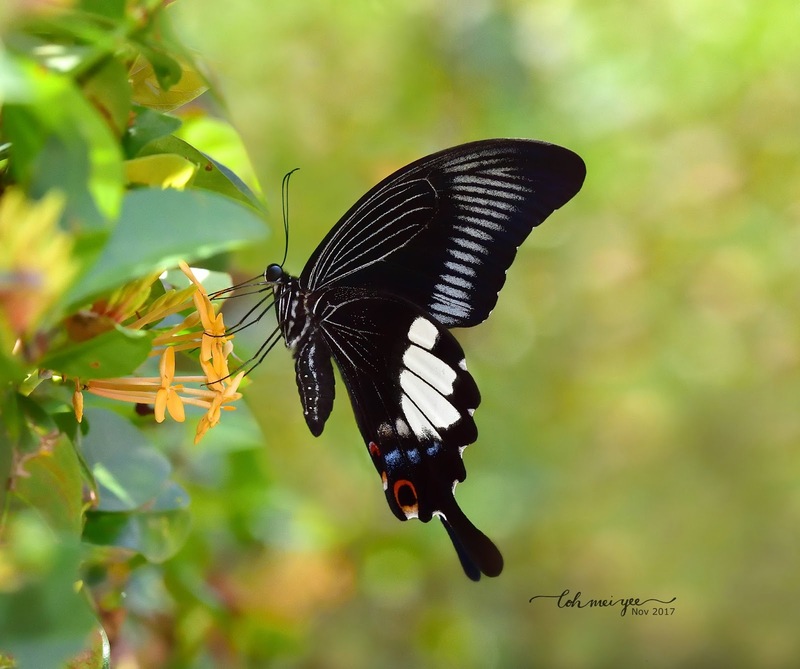 This species was a recent discovery that was added to the Singapore Checklist only in 2014 when a pristine individual was sighted feeding on the flowers of Ixora in south-western Singapore. Recorded as a vagrant or seasonal migrant, we can only speculate that the butterfly may have been carried over to Singapore by prevailing winds. The Red Helen should be looked out for in future. 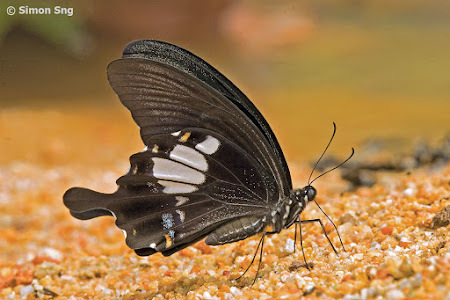 A common, and sometimes abundant species in Malaysia, it is a mystery as to why it did not migrate to Singapore and colonise the nature reserves like its rarer close cousin, the Blue Helen, did. The Red Helen is often encountered puddling on damp sandy streambanks and muddy forest paths in Malaysia. Several individuals can sometimes be encountered at their favourite puddling grounds, in the company of many other Papilionids, Pierids and species of other families. The Red Helen is similar in general appearance to its two cousins, however, the discal white patch on the hindwing is more restricted and does not extend beyond space 3. 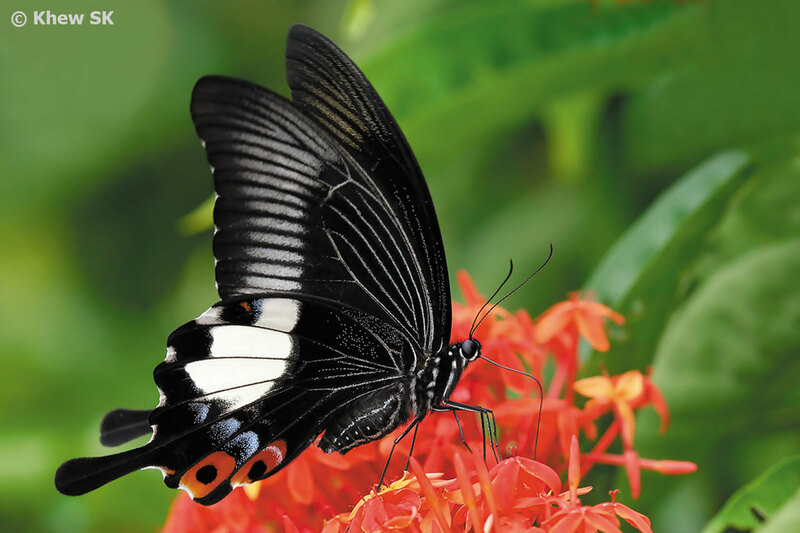 There is a full series of red submarginal lunules on the underside of the hindwing, from the tornus to the apex. 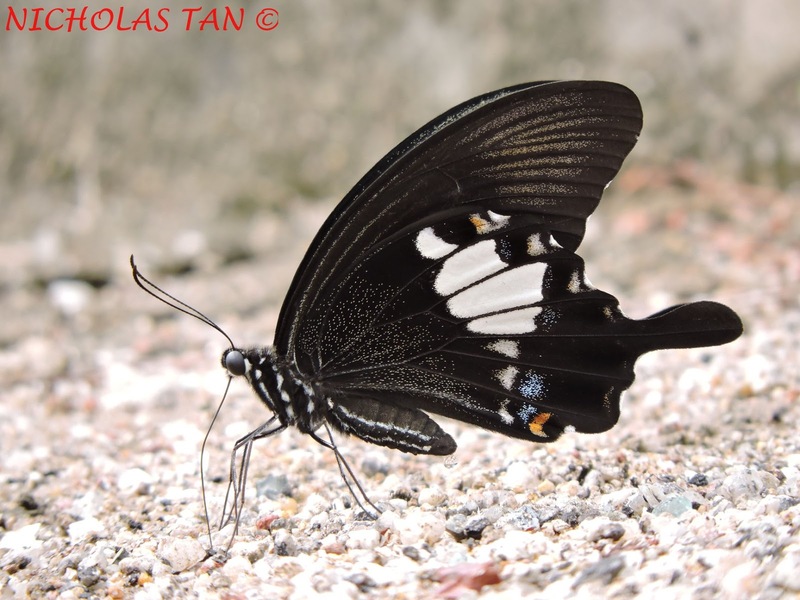 We hope that in future, these Helen species will continue to be seen in Singapore, and the colonies of the Great and Blue Helens will be sustainable. 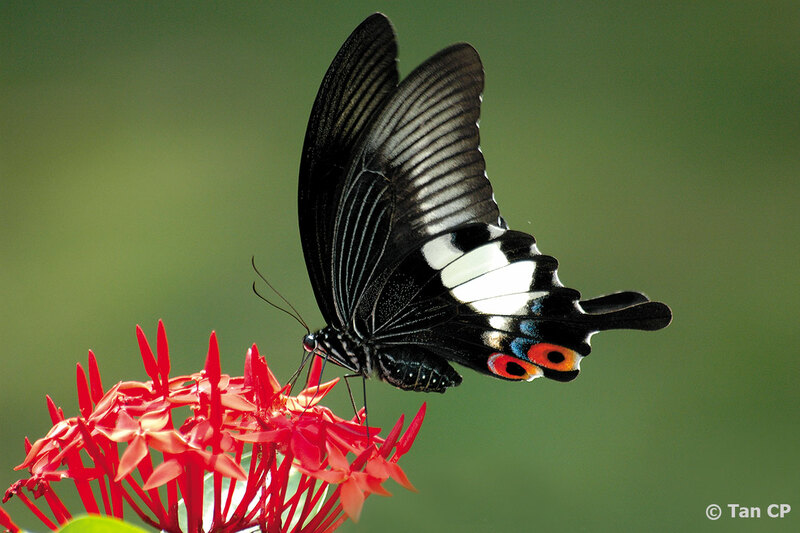 The Red Helen, being a common species in Malaysia, may one day be counted as a permanent resident in Singapore, if the conditions and habitats that it prefers are ideal to support a local population.